Halloween Nail Art Tutorials - Ghost, Jack-O-Lantern & Skeleton! Where did the month go? One minute I was shocked it was the 1st of October and now it's the 30th! 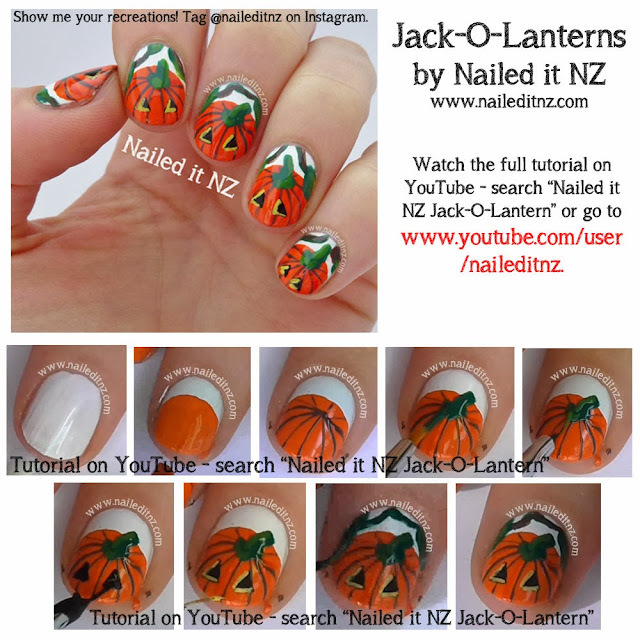 I realised I really needed to get the picture versions of my Halloween nail tutorials out ASAP, as it'll be too late soon. Normally I'd do a separate post for each of these designs but because of the lack of days left in October I'm publishing them all together - which will be handy for anyone looking for Halloween nail art tutorials! 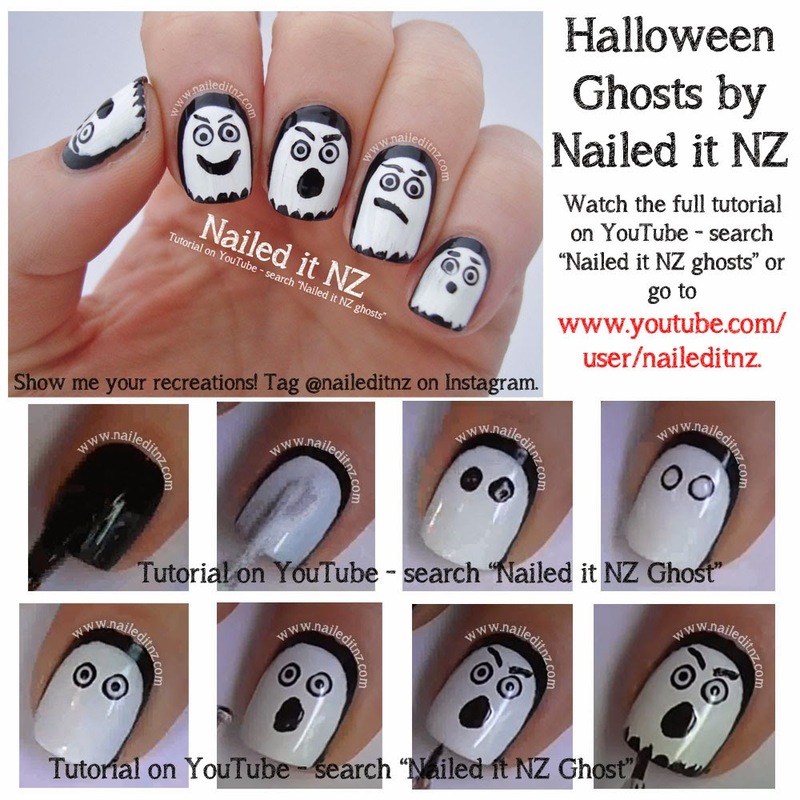 First up, here's how to do my Ghost nails. The first post I made about these little ghosties is here, and you can watch the YouTube tutorial & subcribe below! Next I have my Jack-O-Lanterns, or in my mind "Evil pumpkin" nails. Although they don't look very evil; more cute and slightly misunderstood. Here's the picture tutorial! Here is the post about them, and here's the YouTube tutorial! Last but not least, here are my skeleton nails. One of my favs! Although I tend to love flowers, love hearts and general cheesiness more than skulls, skeletons and death I do REALLY love these. They'd be awesome with glow-in-the-dark polish on, too. Now, I have some exciting news! For those who follow my blog you may remember that I have won/been in two competitions this year - the Marmite factory tour and the Social Games. They've been awesome! This year has been completely life-changing and challenging and taught me that I can do anything I want (within reason!). A month or so after the social games ended I was sitting around bored and thought "hey, lets go enter more competitions!" I searched online for NZ competitions and yep, there were heaps. I chose the ones that interested me, entered, then promptly forgot about them. So when I got rung by a radio presenter yesterday morning I had NO idea what was going on, and didn't even know the presenter's name! (It was Mike Hosking by the way, I feel I may have bruised his ego by not knowing who he was, so this is me back-peddling - I know his wife's name, if that counts!). After (quite) a few seconds of confusion and total awkwardness I was told that I had won a competition called "Sowing the Seeds of Success" with Newstalk ZB and ASB Bank. I remember entering it clearly now (FINALLY) - it's all about giving you a helping hand to succeed, and I put down that I wanted to meet Leah Light, a brilliant celebrity nail stylist from Auckland. I only heard about her a few months ago; as I hadn't even considered searching for anyone like that in New Zealand! I naively thought I was the only one in my country who aspired to have that job. I had entered another competition hoping to meet her but didn't win so I was beyond stoked to win this. Not only do I get my nails painted by her, but she's going to tell me all about what she did to become successful - I'll be sure to take notes! I'm being flown up to Auckland to spend some time with her (apparently she's taken the day off work for it, special!). To make it even more exciting, it's going to be filmed - I assume for TV? Not 100% sure on the details but it's super exciting and this just means so much to me! Hope you like these picture tutorials! 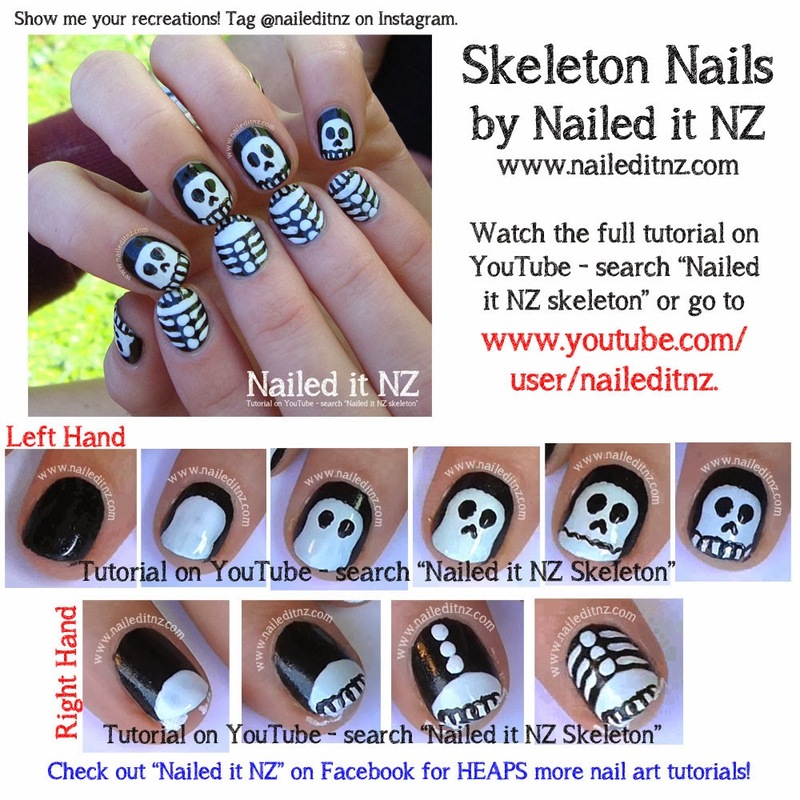 the skeleton nails are my favourite!